Our current e-signing has ended. Books are scheduled to be signed and shipped for the April 5th release. 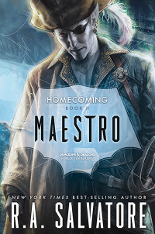 Maestro picks up where Archmage left off, plunging Drizzt into his most dangerous adventure yet, and with all the action, adventure, beloved characters, dark elves, monsters, and demon princes Drizzt fans adore.